Just over a week ago, the Reds’ record sat at 15-30. While dropping two out of every three is terrible no matter how you spin it, another team recently began their season with the same 45-game split yet managed to not only score a Wild Card postseason berth, but make it all the way to the World Series. The Houston Astros went into the 2005 season with high expectations. The previous year, the team finished 18 games over .500 to capture the NL Wild Card. From there, the Astros won the first postseason series of the franchiseÃ¢â‚¬â„¢s 43-year history, besting the NL East champion Atlanta Braves 3 games to 2 before falling to division rival St. Louis in a seven-game NLCS. The Astros had been flirting with success for years. Since finishing .500 in 1992, the team won fewer than 50 percent of its games only once over the next dozen years. That season was unquestionably an outlier, however, as from 1993 to 2004, Houston went an incredible 1,020-857 (.543), highlighted by a 102-win 1998 (one of five postseason appearances during this stretch, during which they failed to finish first or second in the NL Central only twice). That stretch of success seemed destined to end ignominiously in 2005, though. After a 4-1 start that included a home sweep of the Dave Miley-led Reds, the Astros dropped six of seven, five games of which were decided by just one run. After appearing to rebound by winning three straight, the team then dropped six in a row, including three shutouts. None of those losses were blowouts, though, so Astros fans likely werenÃ¢â‚¬â„¢t terribly discouraged by the teamÃ¢â‚¬â„¢s 9-13 record as April came to a close. The wheels came off in May, however. From the 3rd of that month through the 14th, the Astros won just one game. The losses, meanwhile, got uglier, with a 16-0 drubbing by the Braves on May 8 serving as exhibit A. A subsequent seven-game losing streak from May 18-24 Ã¢â‚¬â€ which included an 18-3 shellacking by the Rangers Ã¢â‚¬â€ was no easier to swallow. At that point, the Astros had managed to win only two road games all season long, and just 15 of 45 overall. Following offseason knee surgery, LF/1B Lance Berkman missed the first month of the season and then struggled mightily upon being activated on May 6. After the Astros dropped their 30th game of the year, the three-time All-Star was hitting .179/.292/.268, with just three extra-base hits over 65 plate appearances Ã¢â‚¬â€ a stark drop off from his career line at the time of .303/.416/.563. If Houston had any hopes of turning its season around, Berkman Ã¢â‚¬â€ whoÃ¢â‚¬â„¢d hit an average of 33 home runs over the previous four seasons Ã¢â‚¬â€ would need to shoulder a heavier load. The Astros ended May by splitting a pair of games against the Reds, which brought their record to 19-32. They were 14 games out of first place; they had given up 47 more runs than they had scored; and unless Biff Tannen took Grays Sports Almanac to 2005 rather than 1955, no one in their right mind would have bet on Houston to reach the postseason. Since the point of this isnÃ¢â‚¬â„¢t to write a dissertation about the Astros, but to inspire optimism (or at least, beg the question Ã¢â‚¬Å“what if?Ã¢â‚¬Â) about the 2018 Reds, IÃ¢â‚¬â„¢ll fast-forward a bit by saying that the Astros won 70 of their final 111 games that year (.631), including a July that saw them go a ridiculous 22-7 (meaning, they won three out of every four games they played that month). As youÃ¢â‚¬â„¢d expect, their run differential flipped completely over the seasonÃ¢â‚¬â„¢s final four months (plus a pair of games in October), as they scored 511 runs while giving up only 380, which meant the Astros outscored their opponents during that stretch by an average of 1.2 runs per game. Berkman, meanwhile, ended up with a solid slash line of .293/.411/.524, with 24 homers over 132 games Ã¢â‚¬â€ stats good enough to earn him a handful of lower-ballot MVP votes. Yes, the 2005 Astros proved that itÃ¢â‚¬â„¢s possible to achieve postseason glory after a nasty 15-30 start. 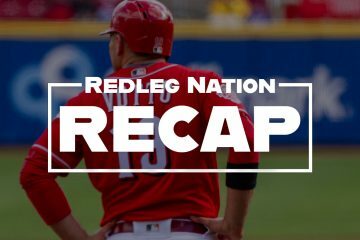 Whether the 2018 Reds can do so, however, is another question entirely. So, what would it take for history to repeat itself? At its core, baseball isnÃ¢â‚¬â„¢t complicated. If you score more runs than the other guys, you win. Sometimes, that happens through great hitting; other times, through great pitching; and more often than not, through some combination of the two. As youÃ¢â‚¬â„¢d expect, during the RedsÃ¢â‚¬â„¢ 3-15 start, they gave up far more runs per game (5.6) than they scored (3.0). Things have improved considerably during the Jim Riggleman era, as the team has scored an average of 4.6 runs over the 37 games going into May 29 while yielding 5.2 Ã¢â‚¬â€œ still a negative differential, yes, but a step in the right direction in that scoring more typically leads to winning more. But is that sustainable? And more important, how can they score even more and/or give up even less? The Tampa Bay Rays recently made headlines by having reliever Sergio Romo start four games. The idea behind such a move is that it prolonged the amount of time it took a traditional starting pitcher (who subsequently relieved Romo) to face the most potent part of the opponent’s batting order for the third time, when starters traditionally fare more poorly than on their first two times through an opposing lineup. The results were mixed Ã¢â‚¬â€œ Romo’s first two starts saw him strike out six over 2.1 innings while yielding no hits and two walks, while his second two starts saw him give up a combined four runs while recording just three outs. While it remains to be seen whether such a move is replicated elsewhere, it showed a willingness to experiment, to flout tradition and to consider new ideas. 2. As long as he remains a Red, and as long as he keeps hitting like this, Scooter Gennett should play, even if it’s not at 2B. Here’s my solution: Let the front office figure out what to do with him in the long term. In the meantime, as long as he’s wearing red, he should be in the starting lineup if the goal is to win. 3. Stop batting Jose Peraza leadoff. As of the time I’m writing these words, Peraza has more plate appearances than any other Red. His OBP (.289), however, is lower than Billy Hamilton’s (.290), meaning that the team has essentially downgraded its leadoff hitter. Who should bat first instead? It depends on who’s playing on a given day. I’d argue, however, that it be someone with a minimum OBP of .350 Ã¢â‚¬â€œ which today would mean Joey Votto, Scooter Gennett, Eugenio Suarez, Jesse Winker or Alex Blandino. I realize Brandon Dixon only has 12 major-league plate appearances to date, but considering how well he hit during spring training and with Louisville, he’s another candidate to consider. 4. Rotate starters more strategically. On May 26, the Reds started Tony Cruz, Adam Duvall and Hamilton Ã¢â‚¬â€œ meaning that on that particular day, three of their starting eight were hitting less than .200. Yes, they won, but that was thanks largely to the heroics of Gennett, who went 5-for-5 and made a game-saving catch in the 9th inning. Still, why start three below-average hitters on the same day rather than giving yourself the best possible chance at winning? If Tucker Barnhart needs a day off, make sure that Duvall and Hamilton aren’t both in your starting lineup. 5. Free Alex Blandino (or Brandon Dixon, or any other player who’s actually producing). 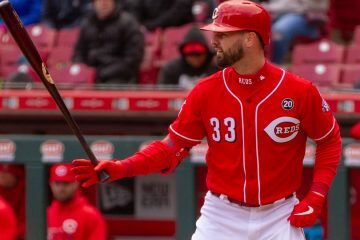 A good player’s WAR value will rise the more they play, so it’s not exactly a great gauge for comparing starters and part-time players Ã¢â‚¬â€œ but still, it’s interesting to note that Dixon’s dozen plate appearances already make him a more valuable player by this stat (0.1) than full seasons of Peraza (0.0), Hamilton (-0.1) or Winker (-1.1 Ã¢â‚¬â€œ yes, his defense is apparently that bad). Is Tucker Barnhart playing today? Is Joey Votto playing today? The answers will help to fill in the remaining lineup blanks. For example, if Tony Cruz starts a particular game, some sort of Ã¢â‚¬Å“counter-moveÃ¢â‚¬Â should be made to attempt to replace as much of Barnhart’s value as possible (e.g., starting Blandino over Peraza and/or Schebler over Hamilton). I gave up trying to construct a flow chart since there are numerous factors to consider Ã¢â‚¬â€œ think days off, LHP/RHP splits and the benefit of starting Hamilton in a larger park with more territory to cover. If the goal is to win, though, it does the team no good if Blandino, Dixon and Schebler ride the pine on the same day, for example. As I type this, the Reds’ record is 19-36, so they’re already behind pace of the 2005 Astros. To reach the 89-win mark Ã¢â‚¬â€œ which is the average number of regular-season victories of the second Wild Card qualifier over the past six years Ã¢â‚¬â€œ they’d need to go 70-37 (.654) from here on out. That’s a tall order, considering that their current winning percentage is almost the exact inverse (.345). Plus, as proven by Monday’s game Ã¢â‚¬â€œ which saw the team smack 16 hits and still lose by 7 runs Ã¢â‚¬â€œ they’ll need more than a potent offense if they want to win two of every three. Clay grew up in Nashville when the city's minor league team served as Cincinnati's AAA affiliate and Reds games were routinely broadcast on a local UHF station. As a child, he was convinced Eric Davis was Superman. As an adult, he's not ashamed to admit he still gets goosebumps re-watching Davis' first at-bat in the 1990 World Series. While he's spent the past two decades living 2,000 miles west of the Queen City, he's still as Reds-obsessed as ever; his son Bronson (pictured, with a ball autographed by DatDude in hand) is living proof. I’ll bet you as much money as you want that Reds won’t make the playoffs. This team stinks. And I agree that the starting lineup should never have Cruz,Duvall,Peraza and Hamilton. I have no idea why they brought Dixon up. He doesn’t play. They might as well just kept Gosselin. I would not have Hamilton and Peraza in the same lineup. When I heard the move to bench Winker, my first thought was they were trying to build trade value for the other three by giving them playing time now. My second thought was that I was ascribing too much planning and preparation to the management. If anyone thinks this team can make the playoffs,I have lots of ocean front property in Arizona for sale just for you. And if you’ll buy that, I’ll throw the golden gate in free! Don’t know who is replacing him, but Cruz got sent down to AAA today. Maybe Stuart Turner again? Reds acquired catcher Curt Casali from the Rays. The best performers in the Reds organization are Scotter Gennett, Joey Votto, Eugenio Suarez and Jim Day. The worst performers are Billy Hamilton, Adam Duvall, Jose Peraza and Thom Brenneman. Keep the first four and trade the 2nd four and we’ll be in business! Wow…. glad you made that clear. In the same vein: To be clear, I don’t expect the Titanic to dock in New York on time. Imagine, if you will – a small market expansion team… only without any lottery picks from other teams to stock their minor league system – I give you, The Cincinnati Reds. You are comparing the Reds, a team that averaged 93 losses each of the past four years and have gotten worse in every measurable way in terms of on-field talent, to a Houston team coming off a playoff year but that just got off to a slow start? Nice try. The Reds may have OVERACHIEVED so far to be a .333 team, when you include a fluke 5-game win streak that probably represented all Riggleman could do to manufacture the appearance of a new attitude. A victory for this wretched team would be to avoid 100 losses. But as a fan since 1962, I’m rooting for 120 losses, a result that might create the kind of panic that would force new everything, from ownership to clubhouse snacks.